The May Walnut Industry Group (WIG) newsletter raised some issues in my mind. It seems that we were not the only people to have a challenging walnut harvest with prolonged autumn rains. This report was in April this year. Intense rainfall has had a major impact on Chile’s walnut production, in particular the late season Chandler variety, says the grower and exporter association Chilenut. You can see the full article here. The report went on to detail how the rain not only caused significant loss of production, but quality downgrade for part of the harvested crop too. They also said that further rain was forecast which was going to cause problems in harvesting the last of the crop. So, reading between the lines it appears the rain must have disrupted mechanized harvesting, and meant nuts that were collected were left out in the rain too long. Nelson Hubber, chairman of Walnut Industry Group (WIG) also said, ” Like many in Canterbury this year Meyric produced the best and biggest crop at our place. Rex let us down with a very small crop due to a November frost. Only a fraction of the amount of last year. Up in the Bay of Plenty production was good, but Rex only had a light crop even though we did not have the November frost. All these observations highlight a classic growers dilemma. How many varieties do I grow? A range of varieties with a spread of pollination and harvest times gives longer to collect the crop, with less pressure on facilities and machinery, and of course, insurance against those unusual weather events. But the flip side is that only having limited selections enables the grower to fine tune machinery to nut sizes and shapes. In theory one would hope that the main variety planted is the most productive, and any others added to the mix will lower average yield and/or quality. The problem with all of this is that a walnut tree is productive for decades, cannot be topworked in New Zealand, and new varieties are coming on the scene all the time. How did you decide what varieties to grow at your place? California’s 2015 walnut acreage is estimated at 365,000 acres, up 12 percent from 2013. Of the total acreage, 300,000 were bearing and 65,000 were non-bearing. Of the walnut acreage reported, Chandler continues as the leading1 variety with 104,450 bearing acres, followed by Hartley with 33,002 bearing acres. Chandler also accounted for 67 percent of the non-bearing acreage. Chandler was released in 1979. That was quite a while ago. Hartley has been around from 1915. Combined sales of walnut trees to California growers were 18,021 acres for the 2015 crop year. The Chandler variety accounted for the largest percentage of new plantings at 75.8 percent. The Tulare variety came in second at 14.0 percent, followed by the Howard variety at 6.0 percent. Tulare and Howard were also released in 1979. So does the release of Ivanhoe in 2010, and now the release of Durham this year cause a change in varieties planted? Here in New Zealand, WIG imported Tulare and Howard, but not Chandler. That was probably a wise move as our climate is quite different. The third variety that WIG imported was Lara, a new French variety, released in the 1980’s. Trials on our place show Lara cropping better than Tulare. But is it more productive than Shannon (1335) which was the best producer at the Masterton trial? In the 1980’s California produced 80% of the world walnut crop. Production had gone up from about 2 tonnes per hectare (t/ha) in 1970 to 3.5 t/ha in 1979. The area in bearing had only increased by 5% in that time, but management had become more professional, with better machinery and varieties. The most promising selection, Serr, released in 1968, turned out to be a fizzer with very variable cropping caused by what turned out to be Pistillate Flower Abscission. (The flowers don’t set.) Consequently growers were very cautious with new varieties, sticking to ones that they knew; Ashley, Payne, Vina, Hartley and Franquette. But in 1983, that all changed when California suffered a season like the Chileans have just had. All their beloved ‘proven’ varieties except Hartley bombed out. Only Chandler and Howard, which had just been released, produced marketable kernel; and everybody wanted them. And now they are averaging a yield of nearly 5 t/ha. So what has this got to do with us growing walnuts in New Zealand? Christchurch growers have settled on Meyric and Rex, and have not planted the heavier bearing Shannon extensively. In spite of Shannon having beautiful nuts, Rex has been planted because of its kernel quality. It is going to take a much better variety for people to shift. Lara might be a contender. It does have the kernel quality. North Island growers, with a wetter climate, are comfortable with Wilson Wonder. Some are starting to plant Shannon and Roadside 12. Will Lara be an option? How did you decide on what walnut trees to plant? Let us have your stories. It will help those who are still planting, or about to plant. For my part, I am still putting in trees, and it is quite difficult to decide what to propagate. This year I have planted Shannon, Roadside 12, and interesting seedlings from the breeding programme. Incompletely formed walnut shells – Cause? I thought I [would] send you some photos of some of our walnut shells. They seem not to have totally formed and look disfigured. It predominantly happens to Tehama and Meyrik Walnuts. And we had quite a lot of it this year. We are looking for some ideas how to prevent it in the future. Let’s start with the basics; how a walnut develops on the tree. My understanding is that we start with the flower in October/November which is not much more than an ovum inside a miniature husk. 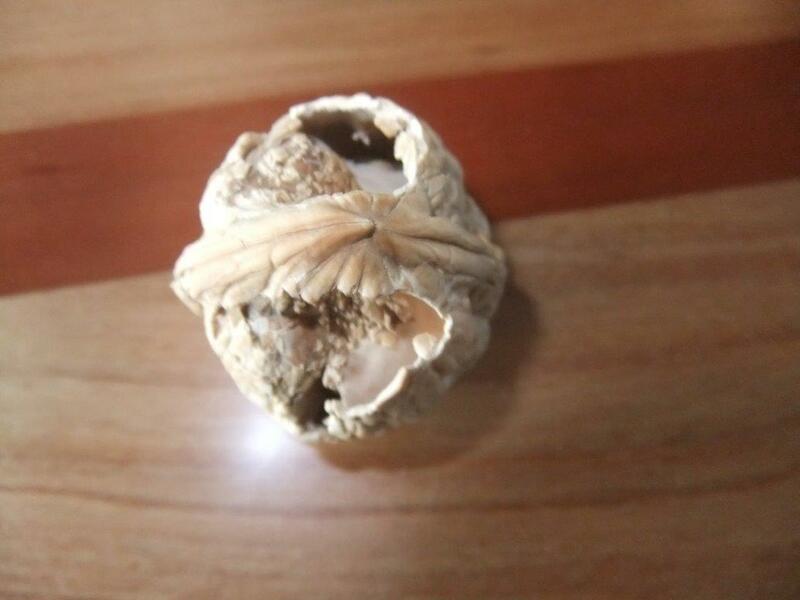 As the nutlet develops it is mostly growth of the husk with a rudimentary beginnings of the shell inside. The shell is nearly full size mid December, and only then starts to harden up, (lignify). Once the shell is fully developed, the kernel inside starts to develop and fill out. From your photos, it looks as though something happened to your trees when the shell was forming that meant there were inadequate recourses for the tree to look after itself and form shells properly. I only know of two limitations to shell development in NZ; nutrient deficiency (It typically happens with boron for Franquette at our place.) or drought. Did you have a bad drought at Christmas time? I googled it and found a Chinese article that looked at the problem and reported that it was correlated to variety and also to sunlight intensity. Presumably the nuts were cooking on the tree, which can be a problem in California too. Are we getting close? Maybe we can work this out together? Did any other bloggers suffer similar shell deformation? In France, walnut distributors are often disturbed by the presence of a proportion of « vitreous » walnut kernels which appear vitreous after drying and at the beginning of the breaking operation. The Creysse Experimental Station has undertaken a study in 1995 to try to understand this phenomena. Observations were targeted at the formation of the nut (type of soil / fertiliser / irrigation), before- and after-harvest parameters (date of harvest / maturity / period spent on ground / time before drying / drying conditions). The analyses, which were carried out on dry nuts (November) and after six months of conservation, were based on the general aspect of the kernels (calibre, colour, etc. ), as well as biochemical analyses on the walnut kernels. The early results show a relation to : – Irrigation : a significant difference between shortened or prolonged irrigation on the percentage of glassy walnut kernels following harvest and conservation, – Harvest date : the walnuts harvested by vibration are more vitreous than those which fell naturally; there is a higher percentage of vitreous walnut kernels in those harvested in the husk, – Period spent on the ground : unlike other parameters (particularly colour), the percentage of vitreous walnut kernels tends to decrease with the increase of time spent on the ground. Hypothetically, it can be suggested that this phenomena is either connected to a change in the water content of nuts, with this content decreasing over time as the nut dries, or that the percentage of vitreous kernels is lower when the walnut kernels are coloured, or that these two parameters coincide. – Drying conditions: Walnuts dried at a lower temperature and at for a longer time have a higher « vitreous rate ». « Vitreous walnuts » do not seem to present any anomalies at the level of general biochemical parameters. I thought this was a cautionary experiment at this early stage of our industry’s development. I am always getting complaints from my customers about the walnuts from the States that are translucent,(vitreous) in appearance. We have never noticed more than the very occasional translucent kernel, presumably because our primitive operation allows the nuts to mature and drop naturally, whereupon we pick them up as quick as we can. But what would happen if we shook them from the trees with tree shakers? Do any of you shake your trees? And what is your experience with translucent kernels? The experiment also hinted at some connection with irrigation practice. What is the experience of those of you who irrigate? The connection with irrigation implies to me that translucence can also occur when there is inadequate moisture to properly develop the kernel late in the growing season, even if the shell has formed properly. If you google ‘translucent walnuts’ you come across Cracker-of-a-Nut website cautioning suppliers about drying their nuts properly. They describe rubbery incompletely dried kernel as translucent. But I would see that as quite different from the greasy kernels that have been shaken from the tree before they have formed properly. Would you make this distinction? Trudi is one of the few who have gone on the walnut blog on Facebook. Maybe it is time to revisit this. If I lost control of the Walnut Action Group blogging and it became Facebook based, that would suit me just fine! Just log onto Facebook and search for NZTCA Walnut Action Group.